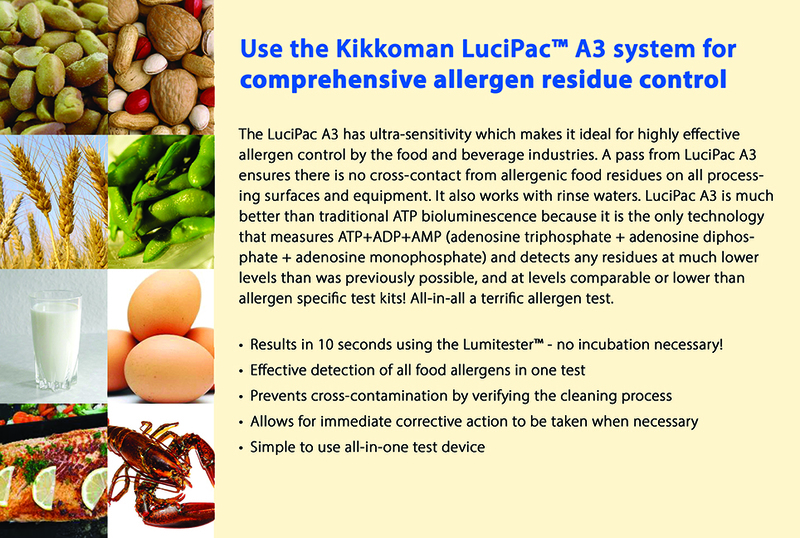 Only Kikkoman’s new LuciPac A3 Sanitation System, distributed by Weber Scientific, detects ATP+ADP+AMP with one swab to give you the whole picture. 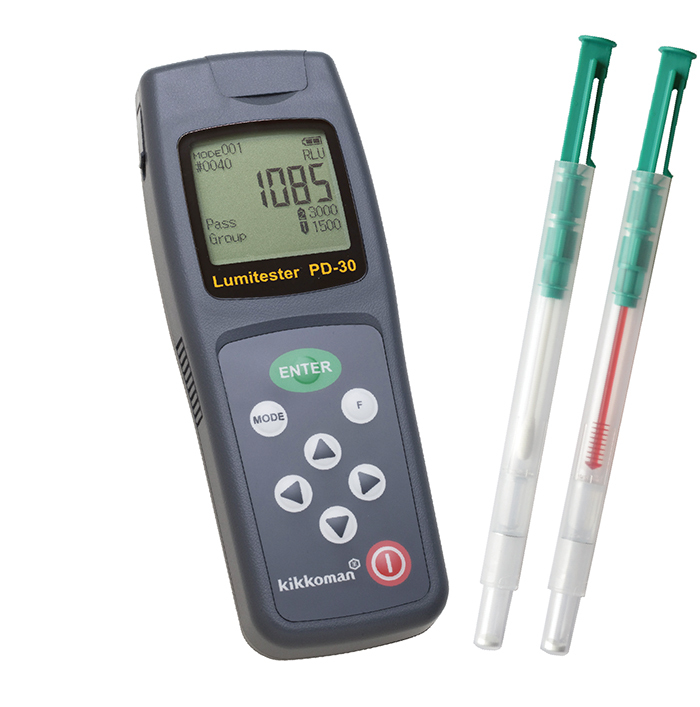 Its patented A3 Technology has been proven to detect residues and microorganisms that others miss. ATP can be unstable and decompose into ADP and AMP. This means conventional systems that test for ATP alone may fail to find the true presence of contamination and may produce false negatives. Only the breakthrough chemistry in Kikkoman A3 technology detects ATP, ADP and AMP - more than any other product out there. Ensure better surface sanitation and support a more effective sanitation program that reduces the presence of resident organisms and the risks from food pathogens. 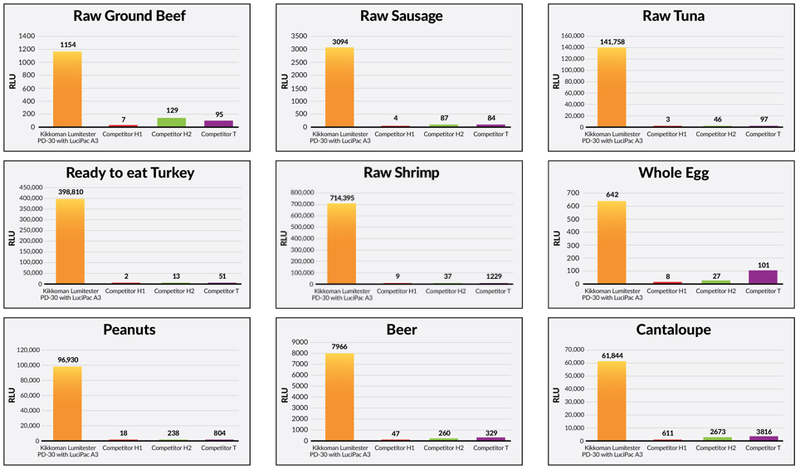 ATP in meat, seafood, egg and fruit is decomposed into ADP and AMP during processing increasing levels of ADP and AMP. 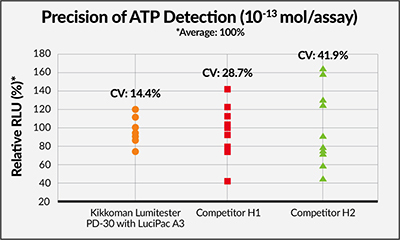 The LuciPac A3 showed superior sensitivity and stability for detection of food residues compared to competitive ATP tests. ATP is a source of energy necessary for various forms of life that are present in organic residues, such as microorganisms, food residue, and biological substances that originate from other living organisms. 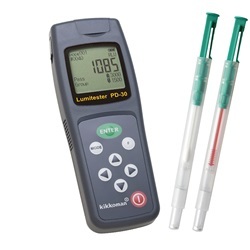 This monitoring system allows you to measure and detect organic residues at high speed and high sensitivity by detecting ATP (adenosine triphosphate) using luciferase, which is why it is widely used in determining cleanliness levels in food manufacturing facilities. 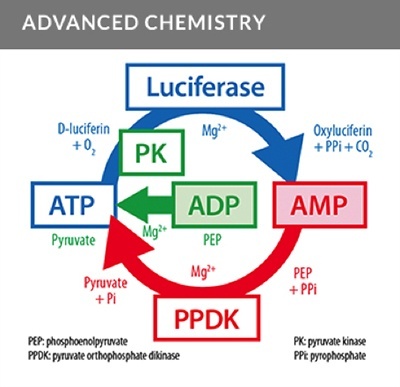 However, conventional ATP monitoring systems are insufficient because ADP (adenosine diphosphate) and AMP (adenosine monophosphate) generated from ATP degradation are completely overlooked. Kikkoman developed a new and patented monitoring system. This method definitely enables high sensitive analysis of a wider range of organic residues. 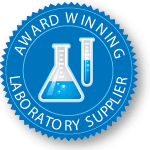 The swab devices should be allowed to reach room temperature prior to testing, if they are from refrigerated stock. Remove the swab stick from the casing. NOTE: If running the test on a dry subject, first moisten the swab or the test subject with tap (or deionized water for consistency)1. Use the swab with consistent pressure. Return the swab stick to the casing and push all the way into the main body. Allow the leftover luminescent reagent to thoroughly dissolve. Insert the swab into the Lumitester™ to measure the results. 1Regular tap water may contain a slight amount of ATP, ADP and AMP. It is recommended to wash or otherwise clean off the faucet in such cases and allow the water to run for a while before collecting any for use. Alternatively use deionized water. 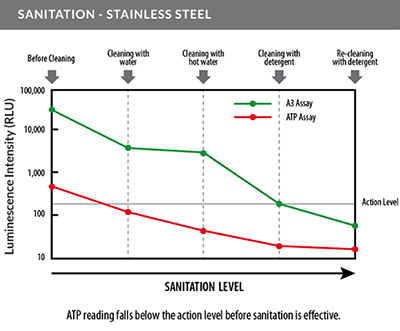 Benchmark levels 1 and 2 are set to determine whether cleanliness levels are at acceptable levels or not (see diagram). 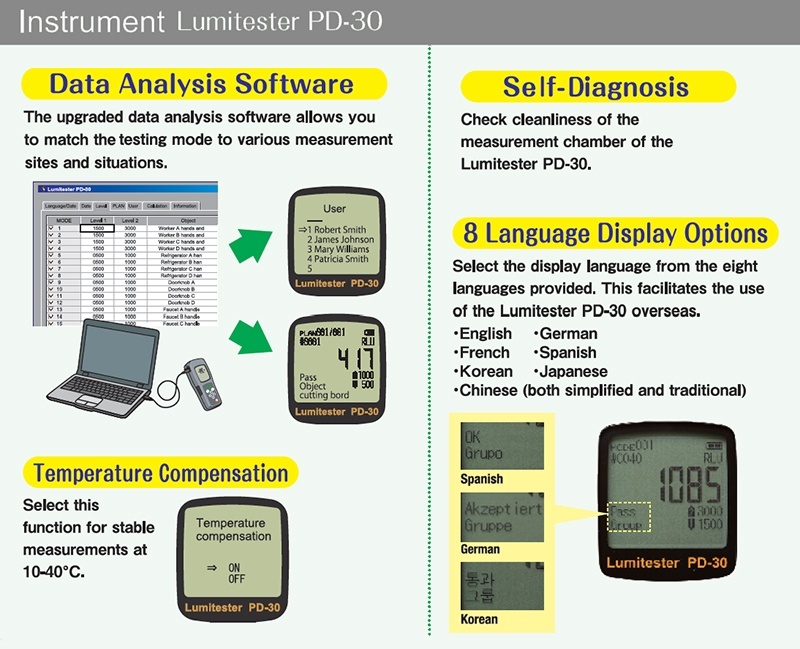 Cleanliness levels are designated as Pass (A) if the measured amount of luminescence falls below level 1 and as Fail (C) if the amount is higher than level 2. With Fail (C), cleaning will need to be redone and cleaning procedures may need to be revised. Cleanliness levels where the measure amount of luminescence is above level 1 but below level 2 are designed as Caution (B), and it is recommended that cleaning be redone and cleaning procedures revised in such cases. Store at cool temperatures (36° - 46°F - 2° - 8°C) for long term storage. The kits can be stored below 77°F - 25°C for up to 14 days or below 86°F - 30°C for up to five days before opening an aluminum bag, without any adverse effect on the long term stability. Do not freeze the kits. 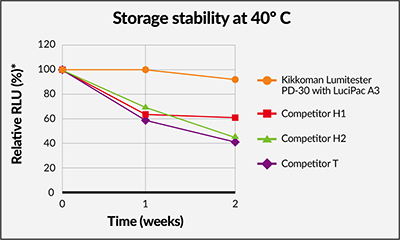 The RLU of LuciPac A3 was decreased only 8% after extreme storage at 40ºC for 2 weeks (see chart). 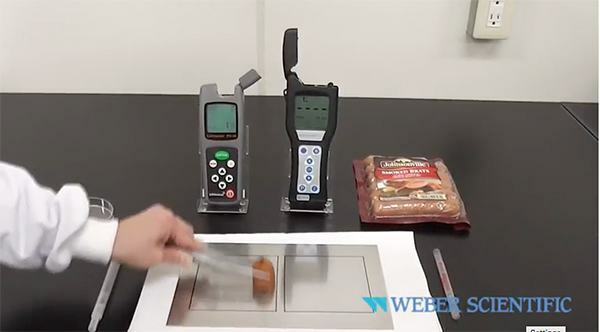 This kit cannot be used to test food or food products directly. Set the benchmark level at which the required cleanliness levels can be obtained. If the benchmark level is not set correctly, cleanliness levels may not be evaluated correctly. A comparison of measurement results LuciPac™ A3 vs Hygiena SystemSURE Plus™, Hygiena Ensure™, 3M Clean-Trace™ UXL 100, Charm PocketSwab® Plus, Neogen AccuPoint®, and Biocontrol Lightning MVP Icon®. Sign in to Buy 71 item(s) available to ship. 71 item(s) available to ship.